I am aware that guinea pigs are not like mice or rats, that is why I chose to adopt guinea pigs instead of buying a few mice from a pet store. I would never put a guinea pig, or any other animal, in a ball. In fact, I am planning on using a hampster ball as a mental stimulation treat toy for my future guinea pigs. I know regular wheels are very dangerous to guinea pigs, that is why I asked about "flying saucer" wheels which are the flat ones. I am aware of how big they get and that they need a lot of space. If you didn't read my first post, I mentioned that I was making a 50 sq ft enclosure for them, but they will be mostly free range. 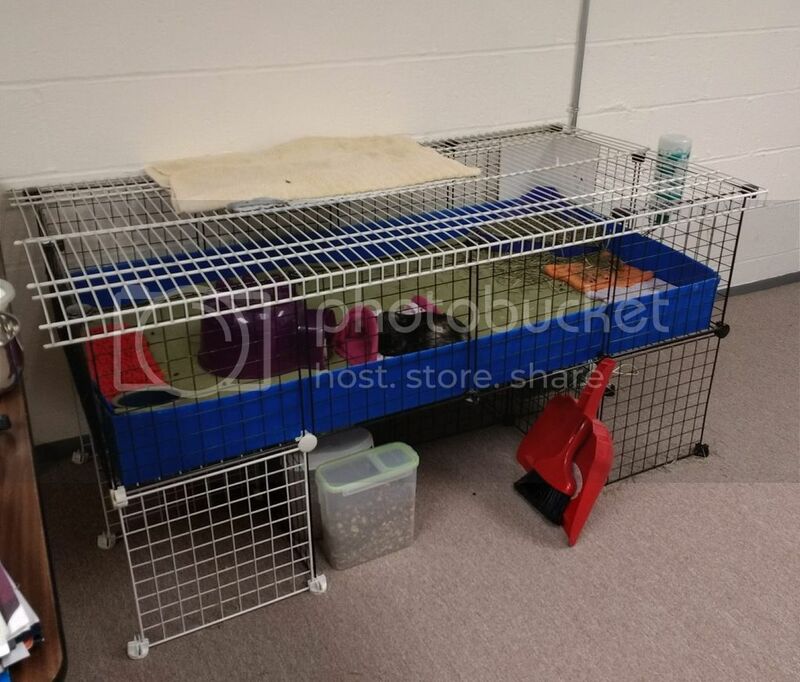 I make all the enclosers for my pets, my dwarf hampster has an entire 15 sq ft of floor space to herself, I don't believe in keeping animals in tiny spaces. I have done months of research, and I have love guinea pigs for all my life, but I knew I needed to wait until I can responsibly take care of them, mentally and financially. But never the less, this forum was created so that people can learn about cavies, so I am researching right now by asking questions on this forum. Thanks for bringing that to my attention though. It was not my intention to sound snarky, only informative. When I see a question about "wheels," it makes me think that the one asking the question is just starting out in their research about guinea pig care. Its impossible to determine how much a person already knows in a post. I was not familiar with the flying saucer type wheel that you mentioned so I googled it. I guess I can't envision a guinea pig using it in the way it was meant to be used. They might hide under it. If they did jump up on it and find out that it moved, I think they would jump down and never get up on it again, as they like to stand on something sturdy. Also I thought you mentioned about staying away from plastics. It's my experience that most guinea pigs don't really play with toys all that much. 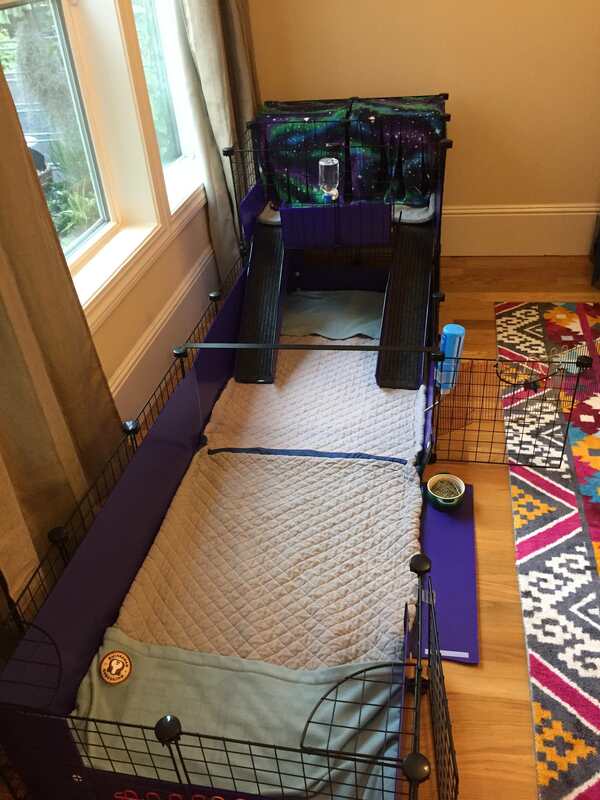 The best thing seems to be to provide them with another guinea pig and room to dart around and do "zoomies." Sounds like they would have plenty of space in the area you are envisioning for them. If you have cats, though, you may need to have an enclosed cage with a lid to keep them safe. Thank you for reminding me. Sorry if I sounded rude. My brother is studying to be a stealsmith, I was hoping he could make nice Lazy Suzan like thing (out of aluminum) with some small rounded ridges for traction, that would work as a flat wheel. I'm not sure, I just wanted to know if anyone has found that it works. I think I'm going to put a wire top so the cats can't get in direct contact with the piggies. Any other ideas? Are hammock hideys ok for them? It seems like it might bend their back in a weird way. We have a C&C cage and really like it. only one of the girls has found her way in to the loft so far though. Cost a bit but way better than the smaller cages we had and the improvised pen we set up. That is a really lovely cage, rjespicer! 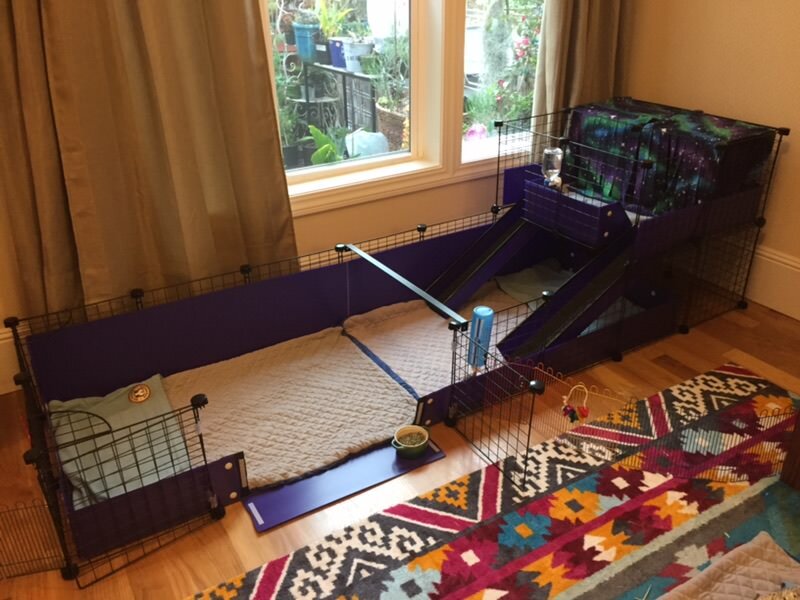 I would love to have a C&C cage, but I couldn't figure out a way to get a secure top so the cats can't get in. Also, any pros or cons of fleece vs bedding? My cage isn't as nice as rj's but closet shelving makes a secure lid if you have cats. I have also seen people make lids with the C&C grids themselves. 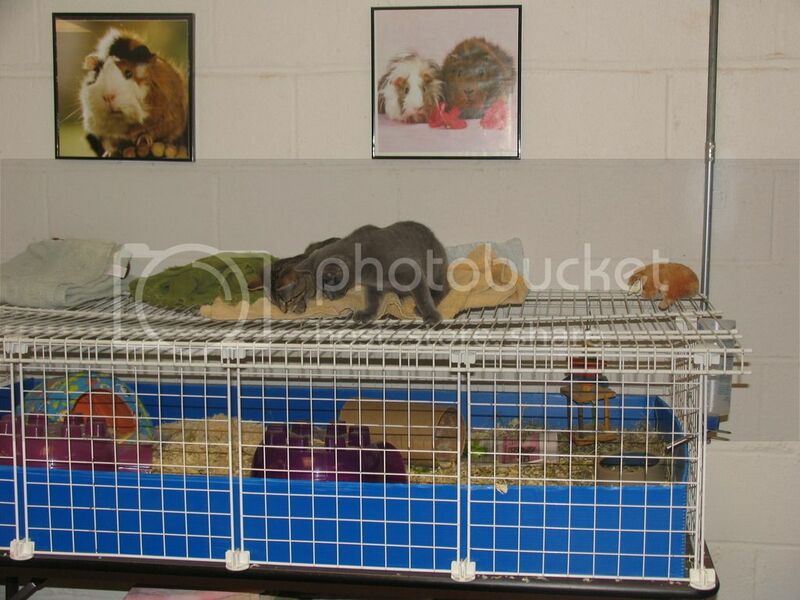 I love the guinea pig pictures on the back walls, Catie Cavy! The cats are very curious. I am puzzling about the creature (live or not) at the far right of the top of the cage. 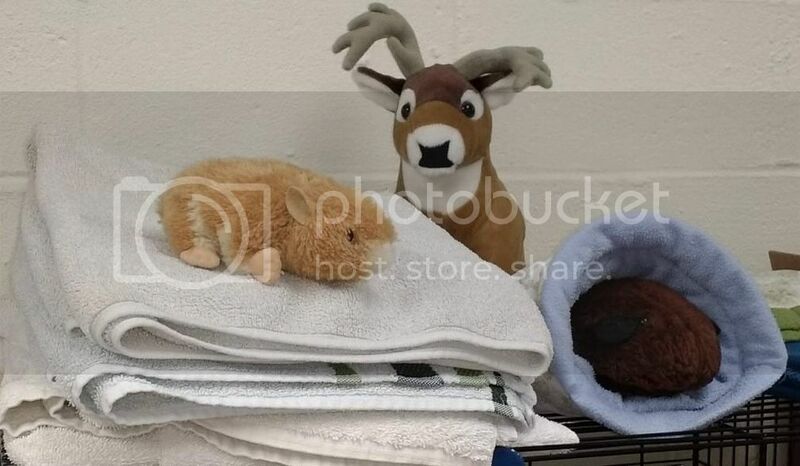 I think it's a plush animal, maybe a beanie baby, because I can see a tag on it. It's a nice, functional cage. Are there zip ties on this though? Especially important to have with those lovely and curious kitties. The pictures were from a calendar. I thought they were too cute to throw away. The plush is a little stuffed animal. I think it’s a hamster. Someone gave it to me because they thought it was a guinea pig. There are only zip ties on the lid. The cats are much older now and no longer as interested in the pigs. My mother made the little stuffed guinea pig on the right when I was a child. Not bad for her first try. How great of your mom to make you a plush guinea pig! I think she did a good job. Pros and cons of bedding vs fleece? Are hammock hiddeys ok for them? Hammock hiddeys sound like they would be okay. Unsure what they would look like. It's basically a hiddey that hangs. Hammock hidey can also be a regular hammock with sort of loops/tunnels sewn underneath. Piggies can lounge either on "the roof' or inside the hidey which is on the bedding level. Originally we were using a combination Paper bedding and hay but found it wasn't ideal and they were eating hay they were pooping and peeing on plus eating the paper. It also made spot cleaning a little harder and we typically ended up doing a full clean and replace each time which meant lots of soggy paper bedding to dispose of. In mid May after losing one of our girls to a URI we switched to Fleeces called Guineadads due to concerns about dust. They have a Quilted Fleece top with a bamboo core (supposedly antibacterial) and a waterproof backing (which doesn't help if they manage to pee down the side of it so it gets under the whole thing). They also have a fleece pocket at one end that the piggys can burrow in to. In some ways they make cleaning easier as you can just sweep up the poop with a dustpan and brush or carefully fold them in half and lift them out and then kind of use the fold to shake out the poop and any other debris in to a bag for disposal. You can then take them outside and give them a good shake to get rid of any stuck bits and pieces. They do seem to wick any liquid away quite quickly but can still feel slightly damp if there is a lot of pee in one place. The Manufacturer suggests that you spot clean like this at least twice a day and then wash the liners once a week (Free and Clear detergent on a cold wash). While we like them we have found that the fleece pockets can get a bit smelly and if they pee and poop in there a lot (which they tend to do as that is the only place they can hide in our current set up at least until the "discover' the loft) it can get quite a strong urine smell. We have found that in practice we have to change them out (we have two sets) about every 2-3 days just to be safe. We typically wash them on a pre soak wash with detergent and then a rinse and spin cycle with no detergent followed by at least two 90 minute cycles on cool in the dryer. I have seriously considered removing fleece pockets or at least folding them back on themselves so they are no longer usable and using hideys instead or moving the fleece forests down from the loft. The manufacturers has also now suggested that you soak them for a couple of hours in cold water at least once a month before washing them to "unlock" any dried in pee in the liner core. I had been doing that every wash for the last 4-6 weeks and it did seem to help get them cleaner and less smelly but will be doing it once a month from now on as soaking them every 2-3 days for two hours is time consuming and I think it got rid of the worst that had built up over the previous 2-3 months. There are other types of fleece out there that use a Uhaul blanket (or two) as the liner. We have a few for the loft but the girls haven't gotten the hang of getting up the ramps and using it yet so i cant say how good they are in comparison. Hope that is of some help. Others may have better advice on other Fleece solutions. I bought one of the guineadads fleece last year, just after they started coming out with them. I know the pigs love it, but I find it a bit difficult to clean off before washing. Maybe I'm not doing it right. Also, with poop problems one of my pigs has, I have to wash it every time I use it. As of Friday we stopped our 3 girls using the pockets on the Guineadads as we realized that since they had been sleeping and hiding in the pockets on a regular basis and peeing and pooping in there most of their URI and breathing issues had started. There is no ventilation of clean air if they are under the blanket. We are currently folding the pockets back but if we continue to see the improvements we have so far with them not using the pockets we may cut the off so the liners lie a little flatter. The other thing with them is that they tell you to wash them in cold water each time and use the cool setting on the dryer. There are others out there (like those on Guinea Pig Market) that you appear to be able to wash with hot water and warm or hot dry which may help keep them cleaner. We may try some of those when our finances recover a little.